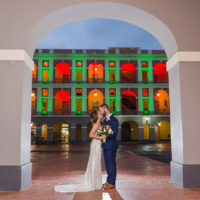 I'm a professional wedding photographer based in Puerto Rico. I've specialized for the last 10 years in capturing details and moments filled with emotion. By the time I'm writing this, I've already documented the union of over 250 happy couples in Puerto Rico, United States, and the Caribbean. Basically, I shoot everything love-related. Weddings in Puerto Rico, proposal stories, engagement sessions, anniversary sessions, couple vacation photos in Puerto Rico, elopements, adventure weddings, vow renewals, and destination weddings worldwide. I love letting you be yourselves and capturing your story as it unravels in front of me, documenting your wedding in the least obtrusive manner. Whether you're looking for great wedding photos in Puerto Rico, or somewhere else in the world, I can't wait to hear your story! Feel free to explore my site, connect with me on the social media (I'm @camillefontz basically everywhere) and, of course, let's chat! Some of the things I love! I love hiking, discovering new cities, great music, and good food! So I'm usually planning trips to do during the off wedding season. So far, I've wandered across South & Central America, Australia, Iceland, and most of Western Europe. I love service. I do this as part of the volunteers at Giving Life, where our goal is to help orphan children everywhere have a bright future. These 8 kids are from our pilot program, our orphanage Jireh Kai D'Amou in Haiti. I'm blessed I was born an Island girl! I sure love/need a continuous dose of Vitamin Sea, and ever since I discovered the million times more beautiful life is underwater, daily life is just a surface interval for me. Cool words from cooler clients! Words cannot adequately describe how grateful we are to Camille Fontanez Photography--however, I'll do my best. When we began planning our wedding day, we started with our budget & priorities. For me, my top priority (other than my groom), was photography & videography. My husband, well, his priority was the Chef/food 🙂 All of my friends that have been married warned me that the day flies by in the blink of an eye...it's a whirlwind! Now, after just celebrating our wedding, I know how true that statement is. So, to have a photographer that is detailed oriented, enjoys their work, professional, personable, kind, on point, & focused...it's a true blessing...& also a perfect description of Camille! I followed Cami on Instagram for a week before knowing she was the one for us. A week is all it took. I could see how dedicated she was & I found myself "hearting/liking" all her photos!! We reached out to her & she was extremely responsive throughout the entire year! (& unfortunately, halfway through our planning, hurricane Maria hit Puerto Rico...) That didn't stop Cami--she continued to communicate with us. We knew that no matter what, we were committed to celebrating our wedding in Rio Grande. I'm so happy we did! The memories that Cami & her assistant captured for us will forever hold a special place in my heart. It's a rare opportunity to have all the people you love in one place...& you never know how much time you have to spend with them. Our photos will be a constant reminder of the love that surrounded us on May 5th, 2018. The best part is that she did all the hard work, we just celebrated, relaxed, & enjoyed the moments. The photos that she provided to us will be treasured for years to come... For any moments that are special to you & your loved ones, do not hesitate in booking Camille. She is an exceptional photographer, wonderful person, & a joy to work with! Miami and Camille was great with communicating with us through the whole process. She is very responsible and professional. She took amazing shots! She was very efficient in the one hour we had after the ceremony to get pictures with our imidiate family and through all the magical spots the hacienda siesta Alegre has. She was also great in the reception and got amazing shots of everyone partying and dancing! Camille is amazing and I recommend her to everyone! Thank you Camille!